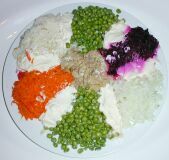 Salat Olivier is a very typical Russian dish. It generally consists of boiled root vegetables, canned peas, cubed ham or chicken, and mayonaise. There are many variations that include hard boiled eggs, canned cod liver, pickles, onions, and chopped herbs. This salad is always served chilled. The recipe illustrated here was provided by Olga. Boil the potatoes, carrots, and beets separately. Cool and peel the vegetables. Cut the potatoes in small cubes, and shred the beets and carrots separately. Pour boiling water over the chopped onion and cool. Arrange the ingredients in a large plate separating them with mayonaise for a nice presentation. Mix them at the table before serving.